Keeping it short and sweet today, as we’re in the middle of preparations for the Closed Beta! And we got a few details that could be of interest to you. Plus a small tease at the coming DevBlog! The Closed Beta will be a bit bigger than last years Technical Test. And if you were one of the lucky selectees, then you won’t have to wait too long. Invitations will be sent out in the coming days, so check your inbox (and spam folders 😉 ). As with the Technical Test, this Beta is not representative for the finished game, which we’re currently finishing and polish so it’s ready for the big launch in April. Some things won’t work occasionally or outright break. This is intentional, as the Beta gives us important insights into topics such as Balance and Performance of the game. So please use the Closed Beta Forums (which will be opened on the english Ubisoft Forums soon) to provide us with Feedback and Bug Reports. No NDA: This Closed Beta won’t have an NDA. That means you can stream, record and share videos and discuss your experiences in public. And we urge you to do so! If you’re on Social Media, make use of Hashtags such as #Anno1800, #AnnoUnion, #AnnoUnionCB und #Anno1800CB, so other Annoholics and ourselves can find your messages. The Closed Beta won’t encompass the full game. The campaign won’t be playable and you can only reach the third residential tier in Endless Mode. Additionally, you’ll be able to challenge or cooperate with other players in Multiplayer, as well as explore and build in the New World. The Closed Beta will run from 31. January 2019 to the 4th of February 2019. If you’re still wondering how to get a chance to participate in the Beta: Log into the Anno Union with your Uplay Account or register a new Uplay Account if you don’t have one. You can do that using the buttons in the upper right corner of this website. There are only minimal changes from the specs since the Technical Test, but please keep in mind that these still aren’t final, as we’re still optimizing the game. DISCLAIMER: THERE ARE NOT THE FINAL REQUIREMENTS! As Anno 1800 is still in the middle of development and performance optimization, you should not consider these specs to be representative of the final game. This test specifically should help us to find some areas where we can further improve the game’s performance. We are still in the middle of localisation of texts and recording voiceovers. Therefore we’ll only be able to offer this Closed Beta in English only. Sorry about that! 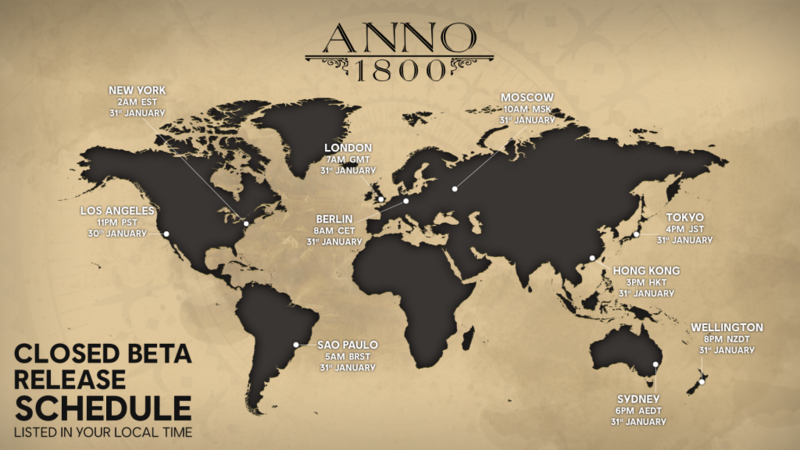 If you have no opportunity to play yourself or need to take a break from being at your computer, then you can still get some impression from the Anno 1800 Closed Beta. You can check out what other players show from the game on Youtube, Twitch and Mixer. Last but not least, we’ll want to show off the Closed Beta Trailer here. It was first revealed during last weeks AnnoCast and gives you an idea about the Feature we’ll showcase in this weeks DevBlog. 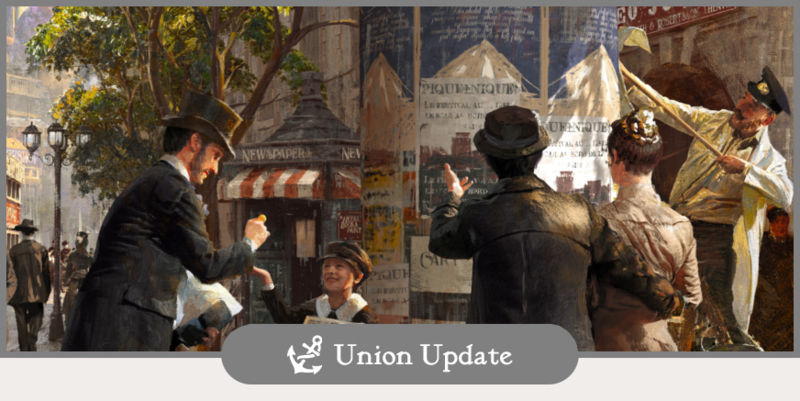 And that’s it for this weeks Union Update. We wish you all good luck to get a Beta invite! Never played an Anno game before, so didn’t know what to expect. I really enjoyed the Beta and would definitely be interested in more in the future! I loved the Beta! I hope that some work on optimisation is done and all bugs are fixed, because there were some problems with the game. Good Luck, Devs, and thanks for the Beta! I really liked the game this time, big improvement compared to the technical test! are key still available? I have been enjoying the vids of the game play and would love to give it a try. Could i still have a key please? Simply watch the trailer, and claim your beta activation! The portal will link you directly to your Uplay account in your browser. Afterwards, launch the Uplay desktop app, download Anno 1800, and get building! anyone out there with a spare invite? would love to play this game! it looks absolutly stunnig! In case anyone is wondering this is actually legit and not spam. Watched the trailer, registered the key and downloading the beta in Uplay now. I would really like to get the key 🙁 But I dont have it. So please Anno Developers, Im steel waiting :D, Or if anyone have a key – write me please.